The light-brown, green color scheme of the Nishigaki Bunko print is probably the earliest. 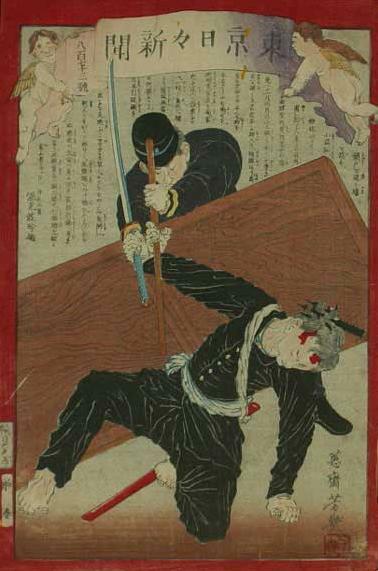 The Chikuzen Shoten print, with the bloody sword and the extra spot of blood on the burglar's neck, may be earlier than the Yosha Bunko and Fukuchi Shoten prints. [He] broke the bolt and crossed the threshold. [This] Petty Robber Chih, [and] the gods, how would [they] forgive [him]? Nishi Kon'yacho in Tokyo prefecture. At the storefront of a pawn business. 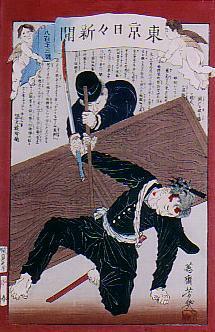 [He] brandished a blade in the cold ice of the 12th month, pushed in during the middle of the night of the 5th day. There is an armed thief. The old mother of the house promptly. Bangs together wooden clappers. Patrol officers hear this. They creap into the house and investigate. . . . . They caught him with a mojiri and pulled him down. . . . As for the actual name of this thief he was a blacksmith. Called Kato Katsunosuke. It takes more than one officer to bring down the thief. 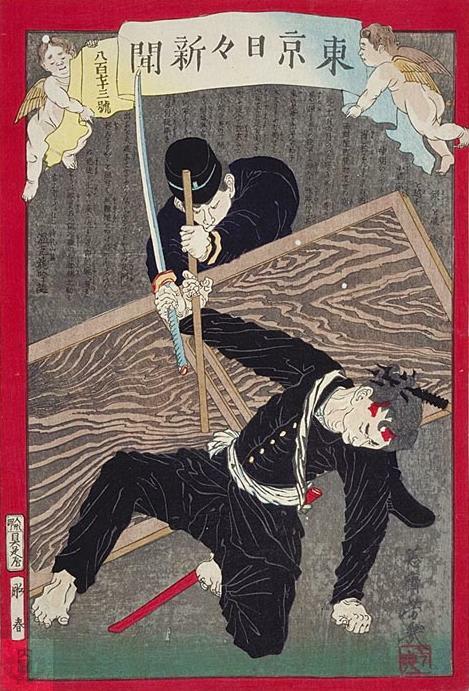 The one shown on the print is wielding a straight stick. Another officer, off stage to the right, has caught the thief's hair in a "mojiri" (see below). Petty Robber Chih reflects 小盗跖 (Shao Tou Seki, Shō Tō Seki), an allusion to Robber Chih (盗跖 Dàozhí), the protagonist of an entire chapter of Zhuāngzĭ (庄子, 荘子 Chuang Tzu), attributed to this 4th century BC Confucian philosopher and his disciples. Daozhi was a legendary robber in the state of Lu in China during the Spring and Autumn Period (8th-5th centurys BC). The Zhuangzi claims he commanded a gang of nine thousand outlaws and dined on minced human livers (Burton Watson, The Complete Works of Chuang Tzu, New York: Columbia University Press, 1968, Chapter 29, pages 323-338). the gods reflects 神明, which was probably meant to be read "shinmei". The expression, literally "divine brightness", can also mean the "benevolence" or "virtuousness" that the gods illuminate by their very being. 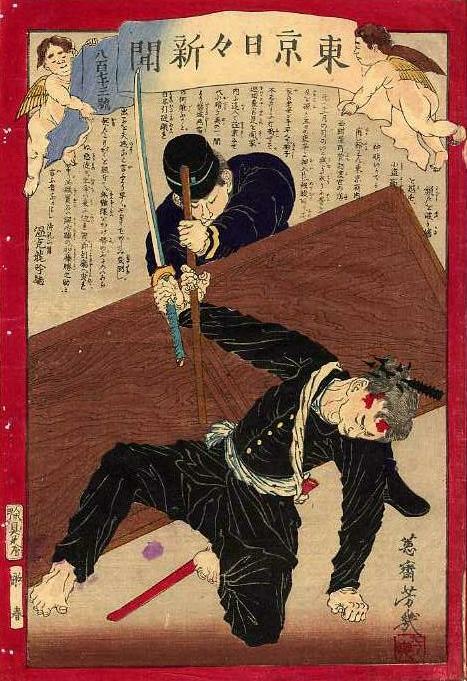 mojiri reflects モジリ, an iron weapon with barbed tongs mounted on the end of a long stick, used to snag a culprit's garments -- hence also called a "sodegarami" (袖搦み) or "sleeve tangler" -- or hair, as shown in this story.